There is good news and there is bad news. So, let’s go over the good news first. 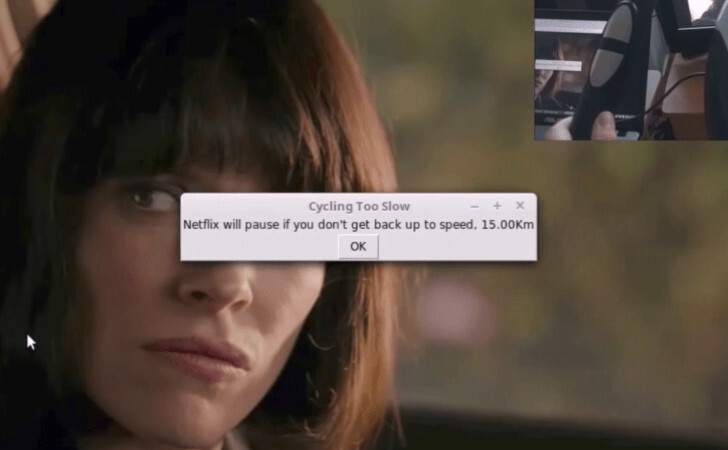 You can now mix watching Netflix with your workout routine. Cycflix is a system that Irish engineering student Ronan Byrne came up with so that he could ride an exercise bike while he’s watching Netflix. It gets a person off the couch or out of bed and actually into working out. So, what could be the problem? First of all, the bad news has several layers. So, bear with me while I hash out all the details with you. The Cycflix system has a harsh component to it that is put in place to motivate you to ride. It will shut the video off when you stop riding. That means you have to keep going and stay motivated to watch your programming. Depending on how you see it, that could be a good thing or a bad thing. For people who want to exercise but can’t get motivated, it’s a good thing. How Cycflix works is it will pause the video if you stop pedaling. Not only that, it will pause if you stop going the pace that you preset. It Has No Mercy On You! So not only do you have to keep going, you have to keep going at the same pace. Don’t slow down. Don’t get tired. You can’t watch the rest of your show. That is until you unhook the system and put it back in normal mode. So, what is another layer of the bad news? This system exists, but it’s not available for sale. Byrne only has it available for himself. But you might be able to hook a system up like this for yourself. Watch the video to see if you can figure it out! Click NEXT to see how the system works!